Team Sahlen returns for the 3rd straight year to the ChumpCar World Series Pittsburgh Grand Prix event at Pittsburgh International Race Complex. In 2015, the team entered 3 Mazda RX7s in the 18 hour event, netting a top result of 4th place. In 2016, Team Sahlen returned for a 2nd shot at OVERALL Victory at ChumpCar’s Pittsburgh event. On Saturday and Sunday’s races, the team led for many portions of the event, only to fall short with 3rd place finishes each day. Now Team Sahlen returns in 2017, hoping that that “3rd time is the charm”. 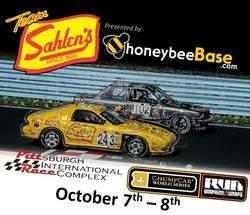 To take on this challenge, Team Sahlen will be entering all 3 of their Mazda RX7s: Charcoal, Ketchup and Mustard. The drivers for these 3 entries will be Patrick Emerling, Joe Sahlen and Joe, Wayne & Will Nonnamaker. The green flag will fly at 9 am on both Saturday and Sunday, with the races concluding at 5 pm.